Giant clicky not actually clicky, dammit, keyboards in Australia! The other day, someone e-mailed me to ask where an Australian shopper could find one of those wonderful clicky keyboards I keep going on about without having to pay fifty US bucks, or more, for shipping from the States. There aren't any Australian dealers of new or used buckling spring or keyswitch keyboards, if you don't count that silly Das Keyboard thing. Well, not as far as I know, anyway; feel free to tell me if you know of one. So the best advice I can usually come up with is "use the eBay e-mail search notification thingy and wait". ...a bunch of these Unicomp Model Ms for sale on Australian eBay right now! Except then a reader who's already bought one, from this same eBay seller, wrote to inform me that these are not actually clicky keyboards at all. The bloody seller has the hide to say "The many different variations of the keyboard have their own distinct characteristics, with the vast majority having a buckling spring key design ... Model Ms have been prized by computer enthusiasts and heavy typists because of the tactile and auditory feedback resulting from a keystroke." in the listings, thereby clearly giving readers the impression that they're buying a buckling spring 'board. And these are indeed "real" Model Ms. But, as explained on the clickykeyboard.com Buyer's Guide page, these are the "library" kind of Model M that's actually just a high quality rubber dome 'board. Big, heavy, solid, probably very reliable, but not the nice-keyfeel clicky 'board you're hoping for. They do not have "the tactile and auditory feedback" that an honest listing would not have damn well mentioned. I apologise to anybody who's bought a keyboard already based on what this post said before I found this out. What a bloody swindle. Shame on you, Fistok. The more observant among you may have noticed that these keyboards do not have a standard layout, and are in fact openly described as "terminal" keyboards. This is usually bad news. Old terminal keyboards seldom have a standard PS/2 interface, and so there's no way to plug them into a normal PC without doing something ridiculous like grafting in whole new electronics, or making your own interface converter with a microcontroller. The seller assures me that these ones, however, have a standard PS/2 plug and all worked fine when he tested them on an ordinary PC. So they're just a PC keyboard with a funny cursor key layout and a bunch of extra function keys that may or may not be of any use to you, but will make you look very important. And they're $AU19.99 plus $AU10 to $AU20 delivery, depending on where in Australia you are. He'll deliver overseas as well. Once again, gentle readers, I call upon you to buy these things up so I don't end up buying one myself. Now find a place that'll sell me a TANK (seen half way down http://e3-keys.com/english/history.htm here) and you'll have a friend for life. I don't know what I'd do with it, but it's far geekier than any Logitech-with-a-piddly-LCD or keyboard they forgot to print letters on, so I want it. 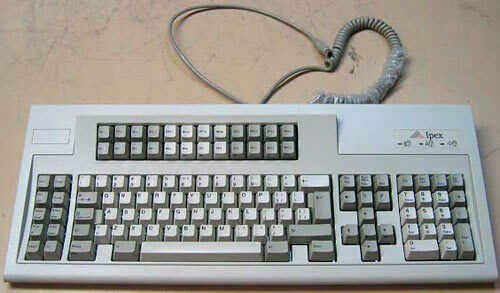 Wow, these are the keyboards we used to have at work (Still do in some parts). There's probably a good chance they're actually our old keyboards from the end-of-lease auction. They're solid, used for callcentre work (so get plenty of use and survive well), and, yes, have a PS/2 connection. There are quirks to the key layout - for instance, without doing key-remapping, you have to use the numeric-keypad's delete key - since there isn't another one around iirc. But I'm not sure if that's just the way terminal keyboards are meant to be laid out. FWIW: To run the F13-F23 and other keys, we needed to load some whacky 122 key driver. It took some effort to make the driver work under XP, and I'm not sure it'd work too well under Vista either. You *might* be able to force them to work with a custom keymap. It doesn't hurt to look in places like Good Sammies for them. Always seems to be a lot of old IBM keyboards when I look. Cheap, and the money goes to a good cause. There are 3 IBM buckling spring keyboards 20 minutes away in Hazelbrook for the taking if you want them, Dan. Well they got me too.....never mind, the 24 function keys alone is enough reason to buy. But the clicky thing would of been nice. So, now I have my fun new keyboard, can anyone point me to where I might find a driver that will allow me to enjoy 122 keys of goodness? A few years ago, while I was still at college, I happened to be in a second-hand store when I noticed a couple of clicky keyboards in a big pile. This was just shortly after Dan's article on the subject, so I picked one up. It cost me all of $2. And it worked quite well for a while, until my wife made me stop using it because of the noise. Last time I plugged it in, it no longer worked. All the traces and cable conductors are in good shape, so I can only assume that the controller chip somehow went bad while it sat on the shelf (no idea how). Fortunately for me, I recently took up the hobby of AVR programming (I took a course in college that used similar microcontrollers, albeit from a different company). Guess what my next project is going to be? I also wasted $60aud on two of Fistok's bogus clicky keyboards last year. I didn't do anything at the time because his listing just tries to imply that they are clicky, he never specifically says they are. However, when I saw him advertising some more recently I had some friends contact him and specifically ask if they were clicky keyboards, he said yes to both of them, even though they are identical to the ones I bought. Just plain dishonest. I got done on those keyboards from fistok too. I asked him if they were buckling spring and he said he didn't know. He knows now.